Probably most of you know the huge new DNZE building at the south end of the UKB campus at the Venusberg in Bonn. Our group, headed by Annett Halle, moved to the DZNE, which is part of the Helmholtz Society, in January this year. At the latest, the official inauguration by the German Chancellor Angela Merkel in March and the associated traffic “complications” made you realize that there is something going on at the Venusberg. Of course, I guess you all know that the main research focus of the DZNE lies on neurodegenerative diseases and trying to understand the mechanisms implicated in early neuronal damage. E.g. misfolded proteins are known to be involved in most neurodegenerative diseasese, however, the underlying processes that leads to neuronal death are only poorly understood. First of all, maybe already new to you, the DZNE is not solely present in Bonn, it has 9 sites all over Germany. Besides Bonn, there are sites present in Berlin, Dresden, Göttingen, Magdeburg, Munich, Rostock/Greifswald, Tübingen and Witten. Meeting PhD students from all different sites at the annual PhD retreat is really nice to get an idea of how broad the DZNE research actually is and, of course, to meet like-minded people “fighting through” a PhD in various disciplines. Overall, all research at the various sites aims at finding new diagnostic markers and developing new cures for neurodegenerative diseases by combining fundamental research with clinical, epidemiological and health science. You will probably all know fundamental research, but what do the research fields “epidemiological, health and clinical science” actually include? One part of population health research, which even might have caught your attention by advertisements spread throughout Bonn, is the “Rhineland Study”. Here, up to 30.000 humans from the aged 30 years and older are monitored every 3 to 4 years. This follow up includes an analysis of physiological as well as psychological fitness based on MRT studies, tests of cognition, the sensory system, blood and further cardiovascular and neurological parameters. This study therefore aims to improve our understanding of factors not only associated with neurodegeneration but much broader of human health. Health care research, in contrast, focuses on the analysis of the current health care situation of people suffering from dementia. Additionally, it aims at improving the quality of life for the patients mainly from a psychosocial perspective. Comprehensive support and counseling of the patients and their relatives is essential to handle a life with a disease for which currently no cure exists. The clinical research is probably still partially familiar to you, as it aims to translate drug targets that were found in basic research into clinical trials. Here, however, besides the classical therapeutical research, the DZNE wants to focus on identifying early markers that herald the manifestation of neurodegenerative diseases not only in brain but also in blood and behavior. Besides, there is of course also a big part of the DZNE that focuses on basic research to decipher mechanisms implicated in early disease stages. Besides the research itself, the DZNE supports the different research groups by offering multiple core facilities and platforms. 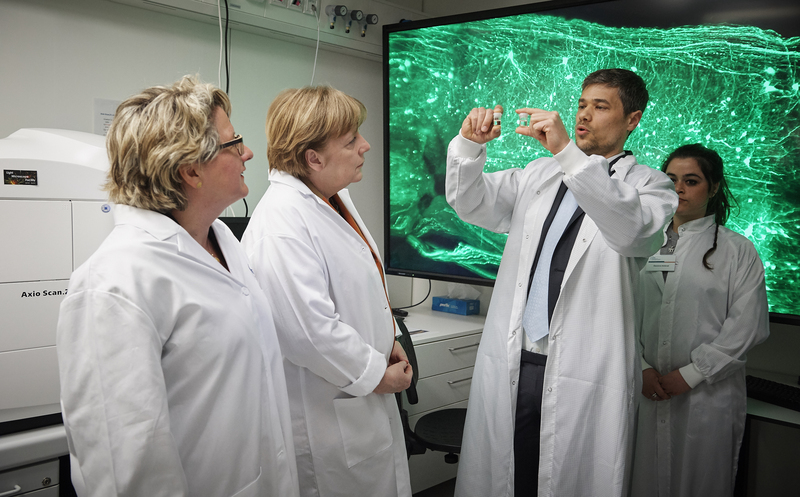 Not only does it have a huge light microscopy facility but also an image and data analysis department, a laboratory automation technologies section and even a single-cell epigenetic platform. This broad research support together with an environment of multiple research groups working in your research field is, in my experience, really what makes working at the DZNE different from working in a small independent research group. That is one aspect that I really enjoy and should, in my opinion, really be taken into consideration thinking of how to choose the right research group and institute in your own academic career planning.